The 7 main chakras are a mystery to most. But to those who have become conscious of how energy flows through the body, they learn to discern the energy flow which is healthy, expansive, and eternal within us. The more we can align ourselves with this type of personal energy, the more we can align ourselves with the expansive and universal energy of the Divine; and in turn, the more we align ourselves to resonate with that Divine frequency, the more healthy and balanced we will become. 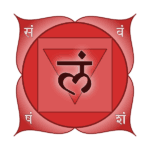 The root chakra involves our physical survival, and becomes blocked by fear. In order to open and release negative energy from this chakra, we must let go of fear. By infusing this chakra with the higher energies of the Divine, fear transform into courage. The root chakra grounds us physically, and it also grounds us mentally, by anchoring us into the present moment. Those with vibrant and flowing root chakras tend to be more balanced and healthier than most. Likewise, they are less fearful, and more grounded and centered. Finally those with congested root chakras tend to feel fearful, unfocused, and off balance, disconnected from others and their environment. To balance and align the root chakra, focus your meditation at the base of your spine. Visualize a bright, red energy, moving down your spine, and then branching out into the earth, like the roots of a tree. Imagine being filled with the earth’s primal energy. Revel in this primal connection, and embrace your fear, own it, then let it go. Breathe in survival. 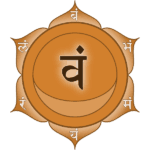 The sacral chakra involves pleasure, and can be blocked with guilt. To align this chakra, we must release our feelings of guilt and blame. Likewise, we need to forgive ourselves our past sins, so we can fully appreciate life’s many small pleasures. With an open and aligned sacral chakra, life is full of awe and wonder. Those with a balanced sacral chakra tend to be happy and adaptable, with an ability to go with the flow. In constrast, those with a blocked sacral chakra often feel confused about their place in the world. The sacral chakra responds to creative and emotional self-expression; art, dance and music. You can meditate on the area just below your naval, imagining your energy flowing out into the universe, like a river into the vast ocean. Visualize yourself flowing with your body’s natural rhythm, balanced with the mighty waves of the universe. Finally, let your guilt flow into this Divine ocean of energy, and feel the Divine pleasure of sacred energy with your breath. The Solar Plexus Chakra harnesses our willpower. Likewise, it can be blocked by feelings of shame. The key to unblocking and aligning this chakra involves letting go of the disappointments of our past, and transforming them into the stepping stones to a higher sense of awareness. Embrace your doubts and insecurities, then burn them to to ashes, and rise like a phoenix. Because life is too short to second guess yourself. 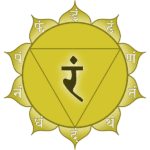 With an open solar plexus chakra, life will be with dynamic, powerful, and authoritative. Alternatively, a blocked solar plexus chakra causes life to be filled with feelings of unworthiness, and low self-esteem. To open the solar plexus chakra, focus your meditation within the solar plexus, imagining a bright yellow light spinning, like a brilliant inner sun. Imagine that sun bathing you in it’s warm, healing light. It melts away feelings of shame, and fills you with a healthy will toward benevolent power. Feel it as the gentle power of the universe. It blesses you with confidence, and the will to engage with the world. Finally, let go of feelings of shame, and embrace your personal power. 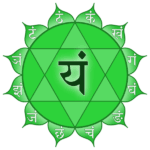 The heart chakra, allows us to love, but is blocked by feelings of grief. Release your feelings of loss and sadness, and transform your ego into soul. Love is letting go of the ego’s attachment to being loved; this is the secret of achieving happiness, in spite of grief. An open heart chakra fills you with an unconditional love for yourself and others, what the Buddhists call “the Great Compassion.” Unfortunately, with a blocked heart chakra, your experience will be a lack of empathy, and a lack of spiritual devotion. To align the heart chakra, focus your meditation within your heart. Imagine a bright green light, spinning and emanating pure, vibrant oxygen, connecting you to the world around you. Next, allow this life giving energy to rejuvenate and invigorate you, healing your heart and nourishing your soul. Next, let go of your grief and regret,. Finally, allow feelings of love wash over you, transforming you, into a being of Light, worthy of love. The throat chakra involves our sense of truth, and is blocked by lies. Release yourself from denial, and accept who you truly are. 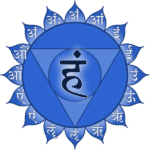 People with an open and aligned throat chakra tend to say what they mean, and mean what they say. Honesty is natural to this chakra. Ultimately, our words must be impeccable, uplifting and wise, our intent clearly communicated. With a blocked throat chakra, communication tends to be poor. Often resulting in codependent relationships, and unclear, insecure thoughts. To align the throat chakra, focus your meditation on your throat. Visualize a bright blue sun, rising up from your Solar Plexus chakra, into your throat. Let that energy wash over your vocal chords, strengthening the Divine to express through you. Next, allow Divine Breath to activate your vocal cords. Finally, let go of your lies, and embrace the truth. 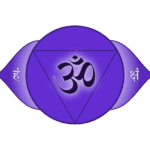 The third eye chakra involves our intuition and insight, and is blocked by illusions. We must move past the illusion of separation, and achieve self actualization, aligning with the Divine frequencies. Those with open third eyes, see themselves and others as spiritually interconnected. Likewise, they have a keen sense of intuition, the gift of self-reflection, as well as a strong sense of personal identity. Those with a blocked third eye often lack imagination. They have a faulty sense of intuition, resulting in poor decisions and self-deception. To align and open the third eye chakra, focus your meditation into the center of the forehead, imagining a luminous, glowing ball of warm, indigo light. Allow this light to flow from your pineal gland, spinning slowly out, touching the center of your forehead. Visualize this powerful indigo light, flowing down through your lower chakras, filling your entire being with Divine Light. Next, imagine your third eye chakra opening, and welcoming the Divine. Finally, let go of your illusions, and allow your intuition to guide you. 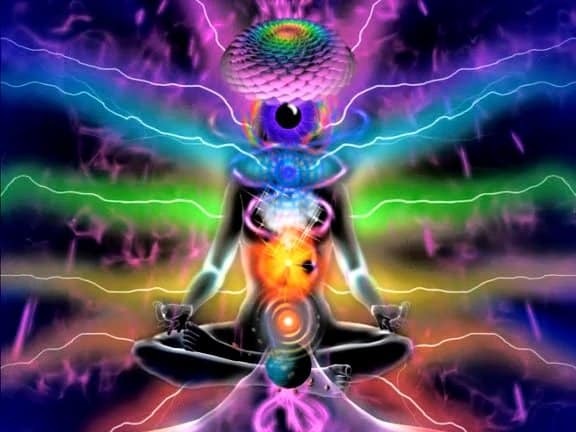 The crown chakra is the key to enlightenment and transcendence, but is blocked by our sense of earthly attachment. Let go of attachments, including love, to open and align this chakra. With an open crown chakra, the experience is one of cosmic union and divine love, reaching out through eternity. Your unique frequency is in tune with the Cosmic Divine. 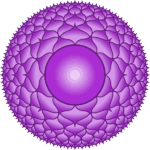 Likewise, a closed crown chakra causes a tendency to be disconnected and nihilistic, doubting everything you know to be true. To balance and open the crown chakra, focus your meditation at the top of your head. Let go of the hold the physical world has on you. Completely surrender, imagining an boundless crown of vibrant violet energy, flowing up into the universe, connecting you to all things. Feel that powerful energy flow up from your root chakra, pass through the sacral chakra, warmed by the fire of the solar plexus chakra, bathed in the loving breath of the heart chakra, cleansed in the truth of the throat chakra, pass through the knowing of the Third Eye, and flowing up and out through the crown of your head, forming a thousand petal lotus. Allow the boundaries of your body, mind and soul to dissolve into the All. Finally, let go of earthly attachment, let go of the need for love. You are now embodied as love itself.